A "Space Ship to wear" for missions on the red planet. The SERENITY spacesuit simulator is a second-generation spacesuit simulator of the Austrian Space Forum. Mimicking the restrictions and technical aids expected for a Mars spacesuit in 2-3 decades. Inorder to reflect the correct force-to-mass ratio, selected subsystems are open-loop systems (like TCS and ventilation) to allow for a realistic weight perception. 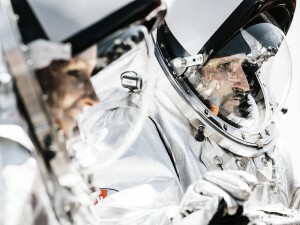 The development of the Serenity spacesuits started in 2018, the commissioning will take place in mid-2019 and in 2020 they will be deployed for the AMADEE-20 mission. 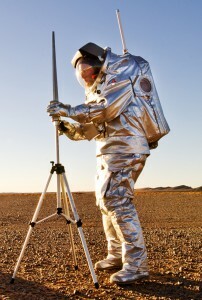 All analog astronauts will be trained on this new generation of spacesuit. 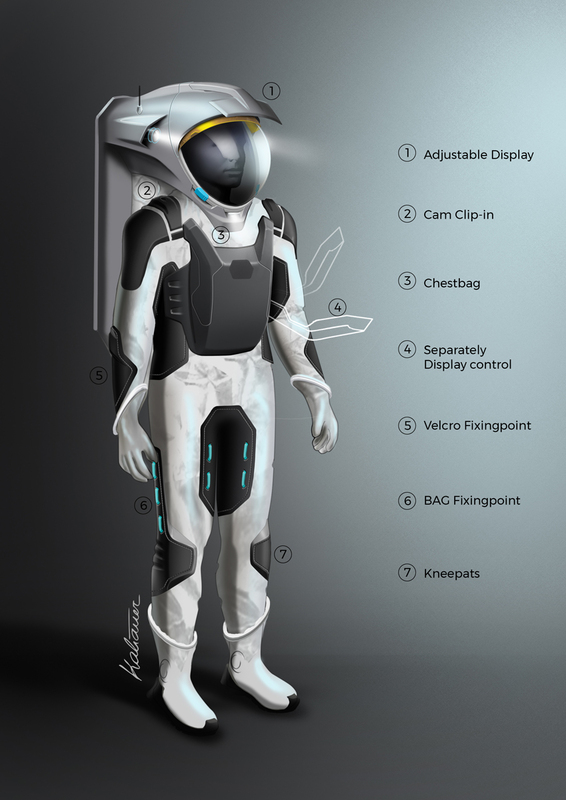 The biggest change to the Aouda spacesuit is the implementation of a rear-entry concept. That means instead of donning several parts of the spacesuit e.g. shoes, trousers, hard-upper torso the analog astronaut enters the suits on the back side. The suit itself will be docked at a suitport on the outside of a habitat. The big advantage is that on the one hand, sand & dust stays outside the habitat (contamination!) and on the other side that donning time can be reduced about 50%. This time can be used to do more experiments during a Mars simulation. This concept correlates to the most recent standards of Mars analog research. 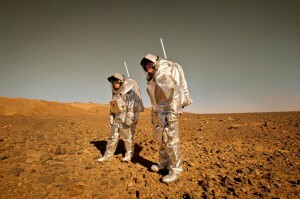 Moreover, the suitport concept enables to cooperate with other Mars analog researchers and to dock at the Mars analog habitat of the University of North Dakota. The Serenity spacesuit is developed in participation with international and national high-tech companies and universities. “Aouda.X” is the first generation of the advanced spacesuit simulator for future human Mars missions of the Austrian Space Forum. This prototype was developed between 2009 and 2018 and emulates the restrictions of an actual planetary surface spacesuit, like weight, resistance or limited sensory input, whilst protecting the (analog) astronaut from the environment and keeping him/her alive. 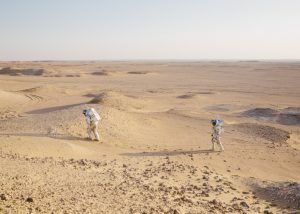 An elaborate human-machine interface, including a sensor network and specifically developed software assists the astronaut during planetary surface operations. The 45kg heavy prototype has been developed to optimize interactions with other (robotic) components, like a rover, and minimize the risk of human contamination. 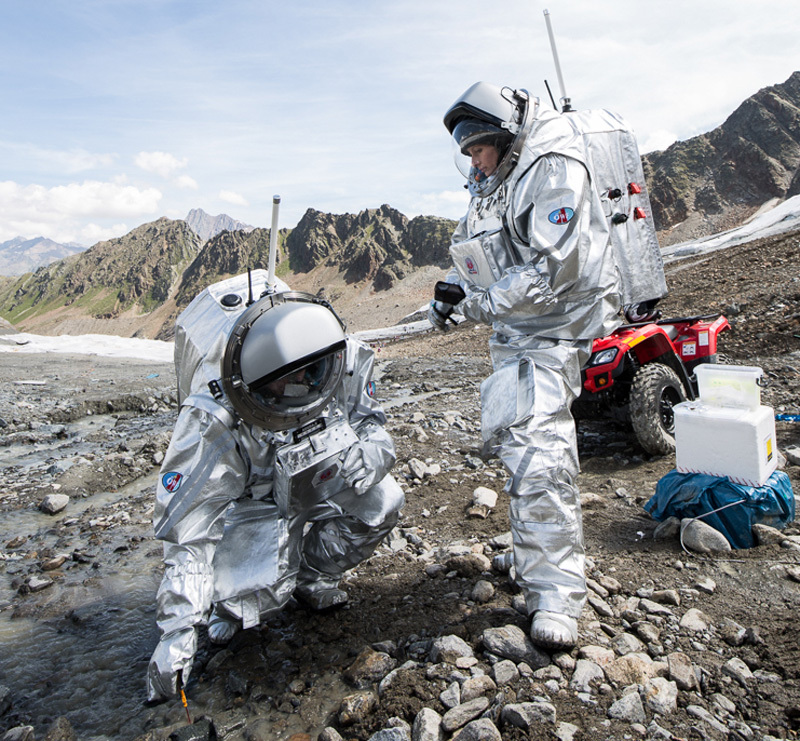 The Aouda suits are operated by carefully selected and trained analog astronauts of the Austrian Space Forum. What is our spacesuit simulator capable of? Apart from restrictions to movement and senses, it is designed to minimize a biological of contamination of soil samples. Our research has shown that the physiological workload while wearing a spacesuit is an important factor for mission planning. By using an up to date human-machine interface it also acts as a virtual assistant for the astronaut, something which has not been possible, for example, with the spacesuits worn during the lunar landings. The analog astronaut can eat and drink inside the suit, has a voice command an gesture control (in development) for a built-in Head-Up Display. Aouda is able to interact with robotic mission elements, like rovers or geoscientific equipment. Human-Machine interface including speach recognition and acceleration sensors. 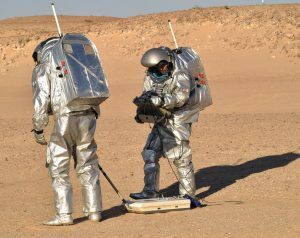 (2) G. Groemer, B. Sattler, U. Luger: „Preliminary Analysis of Spacesuit Contamination Vectors during a simulated crewed Mars surface expedition”, Conf. Proc. of the Joint meeting of the EPSC & DPS, Nantes, Oct 2011, p 1-2. 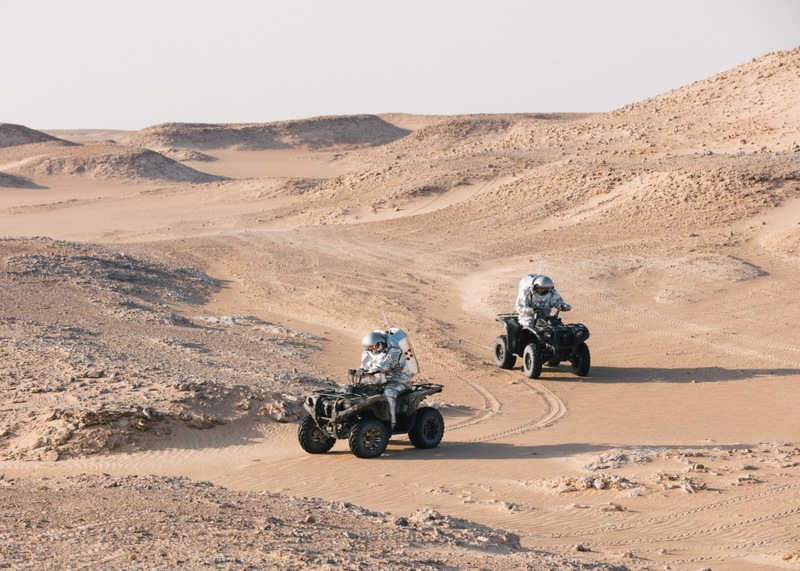 Aouda.X and Aouda.S during the MARS2013 field simulation in the Northern Sahara. 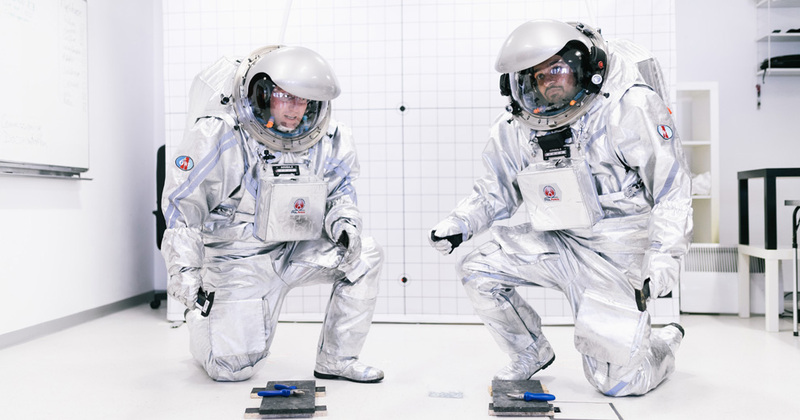 Aouda.X & Aouda.S: These are the spacesuit simulators which are deployed on field missions. In order to wear one of these suits, a certificate by the Austrian Space Forum is mandatory. Can I have a go in the suit? – We are sorry, but no. Only certificated analog astronauts are allowed to work with Aouda. We need the suit for a movie or an exhibition – is this possible? – Under certain circumstances, the two museum-versions (Aouda.A & Aouda.D) can be given as a loan, but not the full working versions. Can I visit the Spacesuit-Lab of the Austrian Space Forum? – While the lab is not publicly available, rare exceptions are possible, for example for a group of technically interested peers. 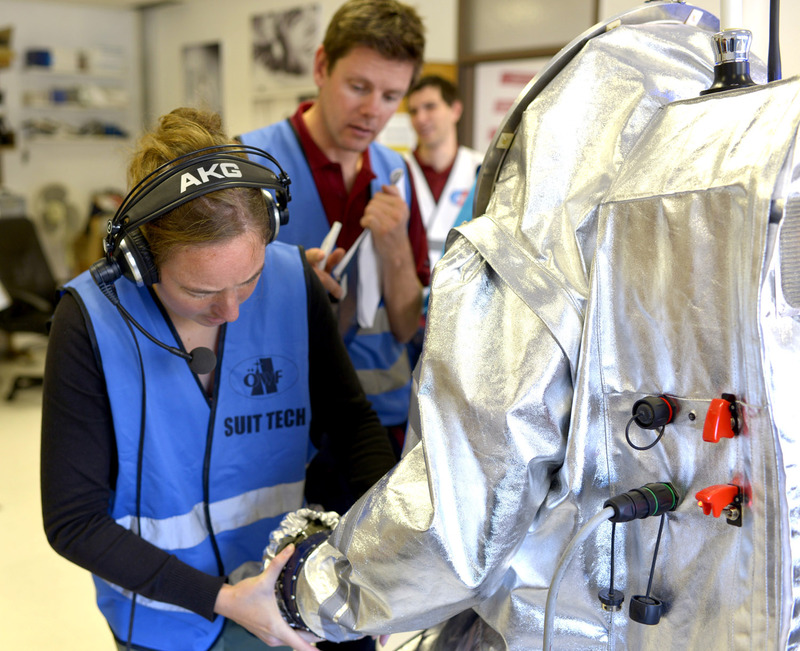 Suit technician Victoria Koch is assisting in the donning of Aouda.X, supervised by AA Christoph Gautsch. Aouda.X and Aouda.S on quads in the hilly, Mars-like terrain of the Dhofar desert. Photo: (c) OeWF (Florian Voggeneder).